I had picked up this kit from the RSN Shop when I was at Hampton Court last month. I was mainly attracted to it because of the geometric design and the colour scheme which is based on a picture of the Wool Rack at the RSN. This picture is used by the RSN on a regular basis on their merchandising items. I hadn’t really paid any attention to canvaswork pieces before as looked a bit like cross stitching and I didn’t really get how a counted design could looks as good as a silk shading or a goldwork piece. Seeing fellow blogger Catherine’s certificate project of Eilean Donan Castle coming together I quickly changed my mind (Check out her project on her blog Hillview Embroidery). It is really amazing to see how different stitches can produce different textures and patterns. So as soon as I finished my silk shading project I started this little kit. The kit is called The Wool Rack in Canvas Stitches and is designed by Rachel Doyle, author of the RSN Essential Stitch Guide to Canvaswork. The kit is available from the RSN Shop and online on their website. Firstly I would like to briefly write about the kit itself, as it is really well put together. The instruction booklet is in full colour with clear graphs and written instructions of the different stitches you need to master to complete this project. The crewel wool is divided in five groups of four so you can’t get confused about which colours to use. There is plenty of wool included in the kit (I might even have enough leftover to make the design again! ), in case you do need to re-stitch parts. The design is drawn on to the canvas so you don’t need to count the pattern. I also had the RSN Stitch Guide to hand but I didn’t really need to use a lot since the instructions in the kit where incredibly clear, which ment that I didn’t really need to look for any additional help. It was so much fun to stitch this project. I really loved the way different patterns are produced by the different types of stitches. Especially since the actual patterns when stitched look really different from the graphs in the instructions. 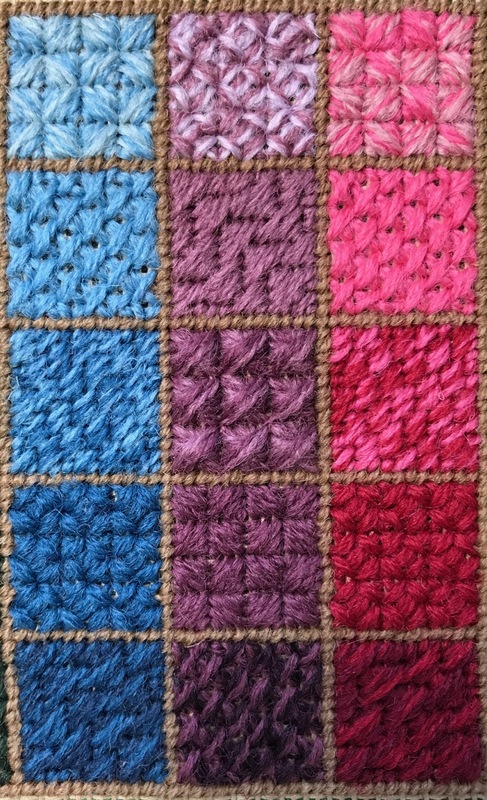 Some of the stitches (those in row 1, 3 and 5) are worked in two different coloured strands. The effect that produces is really nice and creates a nice flow from the lighter shades at the top to the darker shades at the bottom of the design. 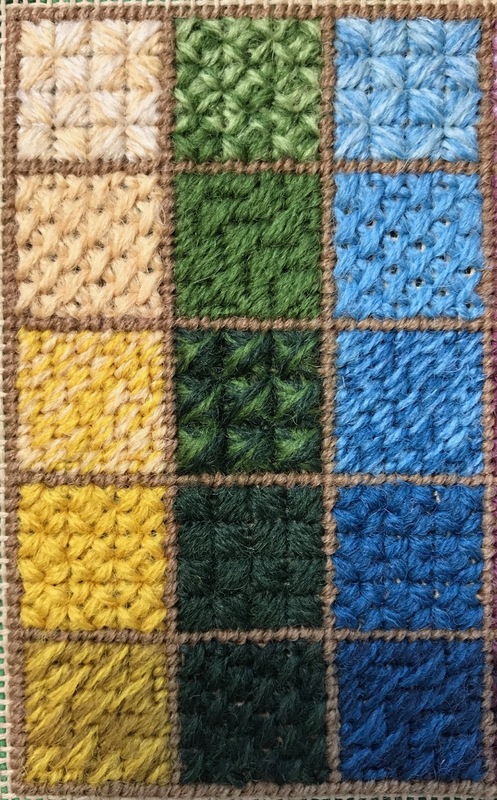 In particular I liked Rice stitch (row 4: column 1, 3 and 5; row 1: column 2 and 4), Reversed Cushion stitch (row 1: column 1, 3, and 5; row 4: column 2 and 4) and Rhodes stitch (row 3: column 2 and 4). So I will definitely use them again in a future project. Another bonus of canvas work is that it is easy on the eye! After two very detailed projects requiring use of a magnifier the stitches in this project are actually visible to the naked eye. Having done so many cross stitch projects I really had to watch myself when stitching Flying Cross stitch (row 2: column 1, 3 and 5; row 5: column 2 and 4) and Rice stitch as the cross is worked opposite to the way I have been used to. These stitches are worked from top left to bottom right and then from bottom left to top right. My cross stitches are worked from bottom left to top right and then from top left to bottom right. It really is surprising how this order is etched in your hand and brain so you really have to pay close attention to do it the other way around! In canvas work it is very important to do the stitches exactly the same every time around since it is the repetition, which makes the pattern work. I am not sure yet what I will turn the canvaswork piece into. I can frame it, or turn into a pincushion like Rachel suggested at the end of the instructions. It will get a place in my craft room though, especially since the colours fit in so beautifully. In other very exciting news, I have taken the plunge and send an e-mail to the RSN to enquire about the certificate course!!! I really hope that I can get it planned and organised as I am so excited about getting started. It is a bit scary too but at least I have already tried all of the techniques studied during the certificate. In contrast to what I had thought only a few weeks ago I am especially excited about the Canvaswork module! I probably won’t start until Autumn, so in the mean time, plenty of opportunity to get inspired and think up the designs I would like to stitch as part of the certificate, and to gain some more experience with the projects from my upcoming day classes! Next articleCross StitchMy pheasant is back! Just a quick question – did you stitch this in a hoop – just wondering what to pack when I go on holiday! Yes I did. But it was quite a work-out to get the canvas pulled tight! Take your screwdriver! It is easier to work these stitches with the same tension using a hoop or frame. Thank you – I did wonder. Hopefully it will keep my hands busy during the evenings. it’s lovely! The colours are fab. I still haven’t had a go at canvaswork, but I don’t know why. Good luck with the certificate, I’m so jealous! I agree, canvaswork makes a nice rest for the eye, and opens up a wonderful new range of textures and effects. You’re about to embark on a great adventure! It looks like a lovely way to get started on canvaswork! It is certainly a very different style of embroidery than anything else I’ve ever done. It’s also probably not my favourite technique! But, it was interesting and I’m intrigued by what more can be achieved by this technique. So excited you have decided to do the Certificate! Will be great to have a fellow blogger doing it too. Looks fantastic, my next rsn project will be either canvas or black work. So I will be having my own take on their sampler this summer.